Whitman Jewellers is now proudly in our seventh decade as North Bay’s trusted location for all of your jewellery sales, service, and appraisals. All of our repairs and customs created pieces are handled on-site in our Shirreff Avenue location, so you never have to worry where your valuables are being sent. Whitman jewellers is a third generation family business with established roots in the community. Many of our customers are buying their engagement rings or anniversary gifts from the same trusted Whitman name that their parents and grandparents did. Stop in to experience our commitment to quality and service. We’re the only location in this area that offers you both a Certified Gemologist, as well as a Master Goldsmith. Ron started working in the jewellery business in 1970, and brings decades of experience to his repair bench and custom jewellery crafting table. 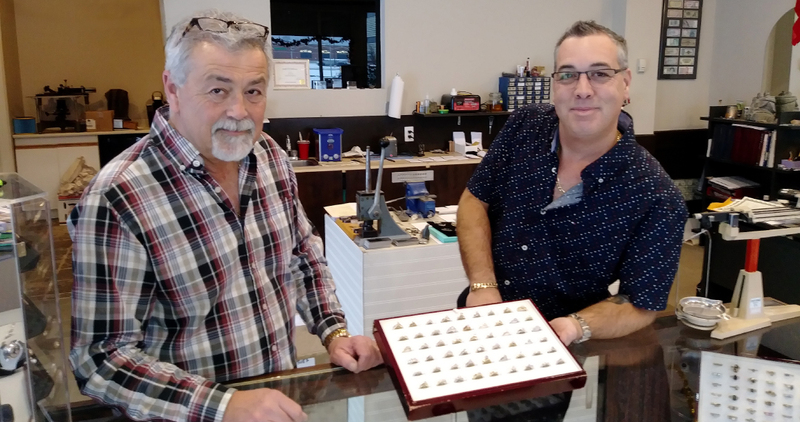 As a rare Master Goldsmith, Ron can work on everything from intricate diamond settings to creating a one of a kind custom piece from nothing more than a piece of gold, silver, or other precious metal. You can let him use his imagination and expertise to create a design for you, or he can take a design or image supplied by you and rec-create the perfect piece. Paul is the third generation family member to proudly call himself owner of Whitman Jewellers. He follows in the steps of his Grandfather Gord Whitman, who first opened the store in 1954, and his father Brint and mother Linda Forbes. He is a Certified Gemologist, making him a specialist when it comes to looking at and grading precious stones. He does it all on-site, meaning you don’t have to worry about a precious piece of jewellery being sent out of town, to a place you are unfamiliar with. Having started in the business after school when he was just a teenager, Paul also brings decades of experience making repairs to every imaginable type of jewellery. We provide peace of mind for all your jewellery repairs. They are fixed on-site and kept safely in our high-security safe. Your treasured pieces are never sent off site or out of town for repairs. With a certified Gemologist in-house, we can provide you with appraisals for any reason, including insurance purposes or simply ascertaining the value of your treasured family heirloom. Each appraisal comes with an official appraisal certificate as well as a photo record for your personal files. Whitman’s can create jewellery from scratch, from a piece of gold, silver or other precious metals, right to the beautiful and unique finished product. As well, we can refurbish a family heirloom such as a pin or broach into something you can wear every day like a ring or a pendant. With our decades of expertise we select only the finest, most unique and well-made vintage and estate jewellery for you to select from. In many cases you can get a beautiful piece for a fraction of what it would cost new. Of course we also carry lines of respected and sought after jewellery so you can enjoy the latest styles or trends, at fair market value for new, top quality jewellery.